Wacken Metal Battle USA is proud to present the first ever final to send one American band to play at this year's Wacken Open Air in Wacken, Germany as part of the festival's international Metal Battle competition. 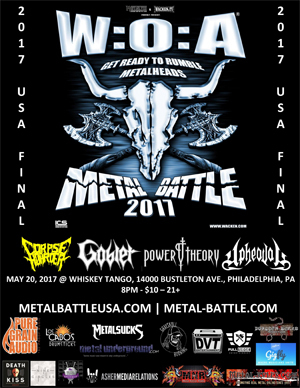 After battles hosted in Boston and Philadelphia, the final four CORPSE HOARDER (Philadelphia), GOBLET (Boston), POWER THEORY (Philadelphia) and UPHEAVAL (Boston) will compete for one to be crowned champion and play the stage at Wacken. The national final will be held in Philadelphia on May 20th at the Whiskey Tango where all four bands will be judged by a panel music industry. Line up and set times to be decided by random draw night of event. For over a decade at the world's largest outdoor metal festival Wacken Open Air, independent metal bands from around the globe have been performing in front of thousands and competing against one another for one to be crowned champion of the world along with winning multiple prizes. For the first time ever, Wacken Metal Battle USA has come to America for its inaugural year and will be hosting qualifying rounds in various cities. The national champion of those battles will perform at the 2017 festival taking place from August 3rd - 5th. Each city will hold their qualifying rounds plus city finals, selecting the top band to move forward to the national final (city and date to be determined) with one being selected to perform at the 28th edition of Wacken Open Air. All bands will be judged during battle rounds by respected local music industry. Travel for the winning band to go to Germany is at their own expense and accommodations at the festival will be in the form of camping in the VIP area.